Dr. Chung is married to Wilmer Cornea specialist, Dr. Albert Jun. Together, they have two children, Rebecca and Noah. The family enjoys good food and travel. They are an active family and love to ski and play tennis. Dr. Chung enjoys gardening, cooking, and entertaining. She also very much enjoys just being with her family and friends. She and her family are members of Central Presbyterian Church in Towson. 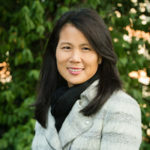 Dr. Chung was born in Baltimore and graduated from the Roland Park Country School in 1985. She received her B.A. at Wellesley College and then went on to the University of Pennsylvania School of Dental Medicine for two years. She realized medicine was her true calling and attended Emory University School of Medicine, graduating in 1996. She was an intern, resident and administrative chief resident at the Johns Hopkins Hospital. She finished her residency in 2001 and moved to London with her family to support her husband in an Ophthalmology fellowship at Moorfields Eye Hospital. When she returned to the States, Dr. Chung joined a small private practice at GBMC from 2002 to 2003 and then went on to work in her father’s OB/GYN practice at Harbor Hospital Center until 2007. In 2007, Dr. Chung opened a solo private practice on the campus of St. Joseph Medical Center in Towson, Maryland. Dr. Chung enjoys every aspect of women’s medicine and cultivating long-term relationships with her patients. She is trained in minimally invasive surgical techniques, including da Vinci robotic surgery. She was named a Top Doc in General Obstetrics in Baltimore Magazine in 2013.